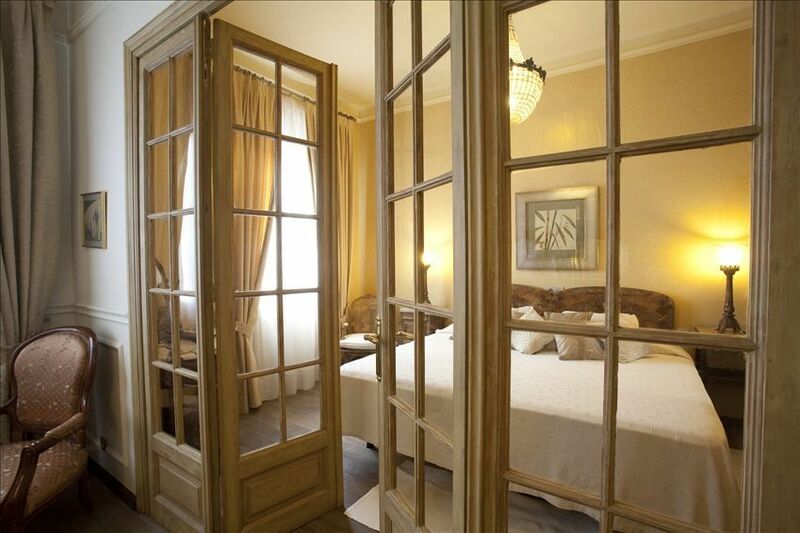 This luxurious three bedroom apartment is situated in the heart of the Gothic Quarter - on one of Barcelona's most important avenues linking the old city to the port. In between Barcelona's emblematic Gothic Quarter and The Born - famous for its great tapas bars, the Gothic church of Santa Maria del Mar and the Picasso Museum. The apartment features high ceilings, generous proportions and has been fully renovated to the highest standards providing every comfort to make your stay in Barcelona enjoyable. There is a large, fully equipped eat-in kitchen with everything you need to cook for yourself on the occasions you prefer to eat in. The living/dining room features a digital flat screen TV with DVD player, stereo system and iPod dock. The windows look out over a quiet pedestrian street and the typical buildings of the Gothic Quarter. The three bedrooms are fitted with top quality beds, 100% cotton linen and towels and each has its own ensuite bathroom. There is WiFi throughout the apartment. You will really appreciate this apartment's location at the back of the building, overlooking a small pedestrian street. You will be able to sleep soundly with no bars, no traffic and no pollution. The apartment is on the fourth floor, with elevator access. The apartment has a lovely welcome pack "FREE of change", in it you will find, wine or champagne, fresh fruit, flowers and chocolate. I live and work an hour from Barcelona, in the province of Girona. My business keeps me extremely busy so I like to go to Barcelona to unwind and take part in its cultural activities. I purchased this apartment because of its fantastic location close to the Old Port - from where I often go sailing with my friends - and its proximity to all of the cultural activities I enjoy when I am in the city. I can go everywhere by foot: the Ramblas, the Picasso Museum, the Cathedral, Plaza Catalunya, the Opera, the Music Festival Hall, the City Park, Barceloneta, the fantastic markets of La Boqueria and Santa Caterina and a huge choice of tapas bars and restaurants on my doorstep. The mattresses and bedding are all high quality (by SAPSA bedding). High quality toiletries by 'Molton Brown' are included. The apartment is great and in an ideal location. The group in charge were extremely helpful with anything we needed. I highly recommend this apartment. Great location. Beautiful apartment. Very accommodating staff. The location of the apartment was fabulous and apartment was very spacious and clean. Juan met us at the apartment and was wonderful. He showed us around and explained everything. There were printed pages of tips around the city and all the details we needed to know about the apartment. We loved it. We loved it. very clean and perfect location. Had everything we needed. Host was awesome! We will return. Beautiful- great location - just as you see on home-away site but even prettier in person!! Location is great! AC does not work! Apartment is perfectly located!! Its very spacious too. However AC is on but never cools so it leads to hot restless nights. We had to buy fans & have manager bring fans too. One shower head in first bathroom does not work. New coffee maker works 50/50. If owner can address these issues the place overall would be great! Thank you for taking the time to post your comments. We are so sorry that there were issues with the AC, and that the shower and coffee maker weren't working properly. We wanted to let you know that we have addressed all these issues and everything is perfect again. We hope to welcome you back in the future! The Opera 'Liceo', the 'Palau de la Musica' and the Piacsso Museum are all a 10 minute walk away. Cancellation Policy: The 25% deposit is non-refundable. If you cancel your booking prior to 30 days, we will not bill you for the balance. If you cancel your booking after the final payment has been received and we can re-let the apartment, we will refund the final payment of 75% plus the cleaning fee.